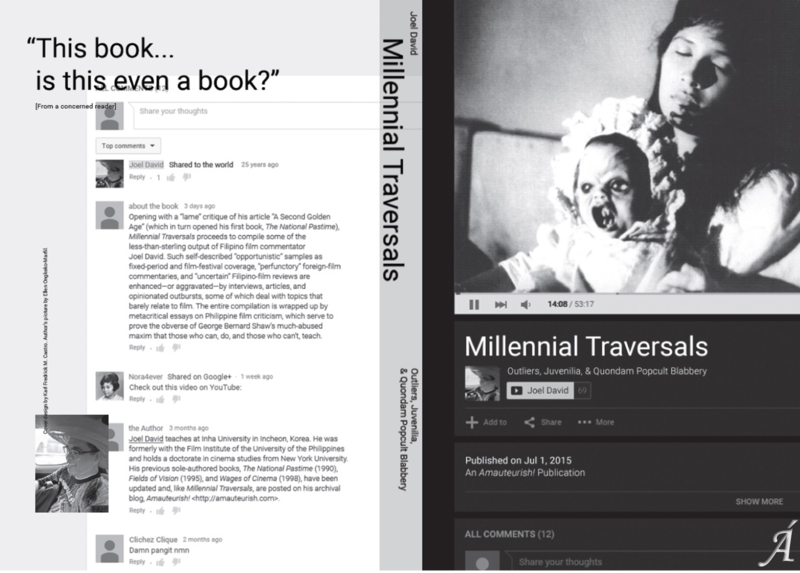 Millennial Traversals: Outliers, Juvenilia, & Quondam Popcult Blabbery is my first book of the new millennium, and like most contemporary claims, that one can be deconstructed at every point: the millennium’s no longer that new, I’ve done other books since 2000 (mostly as editor, but also as dissertation author), and…the present volume is not, or not yet, a book, at least in the printed dead-tree sense that my previous solo-authored ones were. Moreover, aside from my diss, I’ve never really written, much less published, an extensive monograph, which would be the type of book I’d prefer to uphold. Although I expended conscious efforts to ensure that my previously published compilations had as much internal consistency as they could handle, they were still essentially anthologies, as this current one is; and maybe the distinction of Millennial Traversals is that its pretensions reside elsewhere, no longer in trying to appear like a deliberately planned and duly parsed product. My rationale for insisting that the present exercise is still part of the continuum provided by my previous volumes is simple (shaky maybe, but simple): The National Pastime, Fields of Vision, and Wages of Cinema all exist in revised and updated form on my archival blog, so Millennial Traversals merely skipped the paper-and-ink stage and got to be introduced to its readership in digital format. (I’m still planning to have “publishable” PDF versions of all the texts I’ve mentioned here, but I can’t foresee right now how soon I’ll be able to work that out.) In this manner, virtually all my non-academic (and a few academic) film and culture articles will have been compiled in book form. The positive aspects of creating a strictly open-access book revealed themselves in separate stages. I knew that I wouldn’t have to deal with publishers’ and editors’ and readers’ quirks, which for some reason assume creative dimensions when they confront popular culture material; that included the corollary advantage of having the longest manuscript text I ever compiled, nearly double (in terms of number of articles) that of The National Pastime, my previous longest book. When I cooked up a title, I realized I could formulate something that any sensible publisher (or her accountant) might faint upon hearing, and I could lump together anything I wanted without worrying about possible objections like why foreign films? why incomplete period coverage? why the shifts to other media and even to non-media? why the wide divergence in analytical approaches? I could improve on the texts at any time and place, although I do hope to minimize my tinkering once the manuscripts go public. I won’t need to strengthen an opening essay that I knew was too lame by my standards, since I felt when I was writing it that it just needed to be placed out there in order to temper, if not overturn, my very first book’s unexpectedly influential first essay. The foreign-film reviews still seem rather perfunctory, which was why I had no problem eliminating them from my earlier books – but they somehow assumed increasing usefulness the longer I kept at them. The local film reviews similarly dropped out from the pre-millennial books because of their uncertain significance in relation to the rest of my output, although they still could function as markers of an era; in Millennial Traversals they serve to indicate my interest in as wide a variety of film types as Philippine cinema makes available. 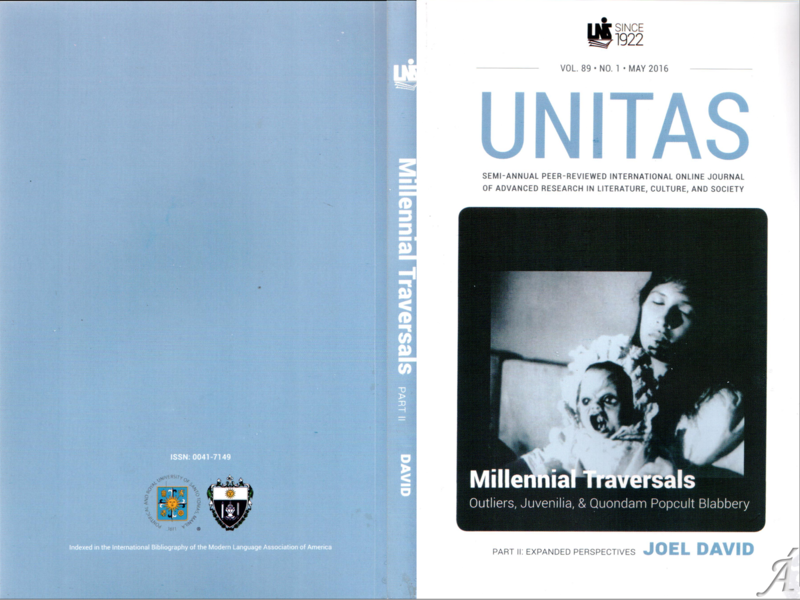 To read the book lecture “The Millennial Traversals of Millennial Traversals,” please click here. Two years after this volume came out, a monograph I drafted for Arsenal Pulp Press’s Queer Film Classics, on Ishmael Bernal’s Manila by Night, was published. Another twist in the publication saga of Millennial Traversals is that it has come out in print form, via the University of Sto. Tomas’s UNITAS: Semi-Annual Peer-Reviewed International Online Journal of Advanced Research in Literature, Culture, and Society. Part I is listed as Volume 88, No. 1 (May 2015), while Part II is Volume 89, No. 1 (May 2016). The links below will take you to the UNITAS open-access website, where the volumes have been uploaded. This entry was posted on Wednesday, July 1st, 2015 at 10:21 pm	and tagged with Criticism, History and posted in Book. You can follow any responses to this entry through the RSS 2.0 feed.